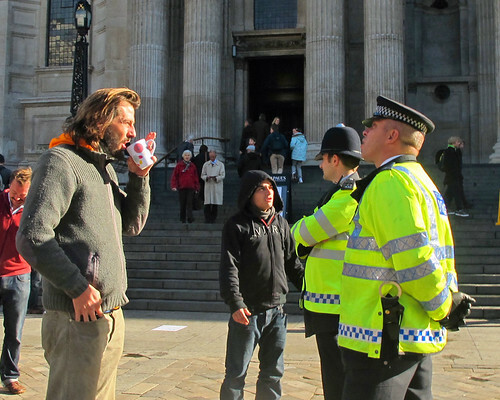 On the steps of St. Pauls Cathedral last Saturday, hunched over a cup of tea, the grumbled disdain of a British protester could be heard, “Here we go again, borrowing from America.” Yet while the Occupy movement may have started stateside, protest camps have been around in the UK for years. There is something about the form, the vision, the collective ethos of protest camping that British people find irresistible. And whether or not they know it, those now occupying the square outside St. Paul’s Cathedral are building on a great British tradition. The largest and most infamous camp in UK history is Greenham Common. What started in September of 1981 as a peace walk of a strong willed few, swelled to become an international movement. Within two years anti-nuclear camps had begun around the UK at bases in Faslane and Molesworth, as well as across four continents with camps in the US, Canada, The Netherlands, Germany, Italy, Australia, South Africa, Japan and Honduras. The tactics and strategies developed at Greenham Common and in the peace camp movement broke with traditional left styles of organising, centring on creative direct action and non-hierarchical decision-making. At the turn of this century the form of the protest camp expanded to large scale anti-summit mobilisations. In the UK, this truly took shape at the Horizone EcoVillage against the 2005 G8 summit in Gleneagles. The camp opened for two weeks providing shelter and food for 5,000 campers while serving as a space to plan and enact protest aimed at the summit. 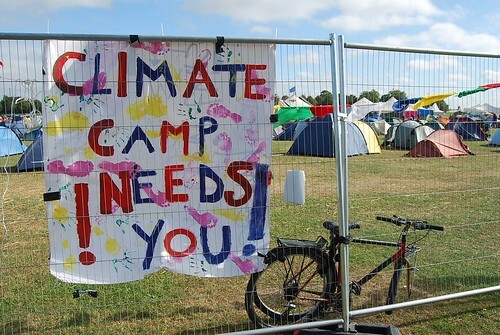 Building on the Gleneagles experience, climate camp was born in 2006 outside the Drax coal-fired power station in Yorkshire. The camp drew 800 activists, enough to make a marked impression on national media and capture peoples’ imagination. A year later at Heathrow, camp numbers increased to 2,000 for a week long protest against further airport expansion. Following years saw more UK climate camps around the country in Kingsnorth (2008), London (2009) and Edinburgh (2010), and further afield in Canada, the US, Germany, Denmark, France, Ireland, the Netherlands, Belgium, Ghana, Australia and New Zealand. This is just a small sampling of British protest camps. In each of these places, camps played a pivotal role, acting as a central base for a broader social movement. What often began as a single camp in a specifically chosen place, spread to neighbouring towns, cities, countries and across continents. While each protest camp is distinct, their organisational structures are similar and their goal of building a better world resonates across time and place. With Occupy the London Stock Exchange and smaller encampments in Nottingham, Birmingham and other UK cities now in their second week, and Occupy Finsbury Park continuing to grow, eyes are poised to see if the OccupyTogether model has sticking power across the pond. With current movements against austerity measures already underway, highlighted by the half million strong J30 march last Winter and N9 and N30 strikes and demos planned for November, the sentiments of Occupy Wall St. are certainly shared across the UK. Mix this with a 30 year history of some of the most inspiring and successful protest camps the world has seen and we just might have the recipe for a long-lasting Occupy UK. This entry was posted in protest camps and tagged financial crisis, Greenham Common, occupy lsx, occupy wall st. Bookmark the permalink.